Until now, really high tray sealing speeds could only be achieved on platen-type machines, which offered limited flexibility when changing from one pack type to another. 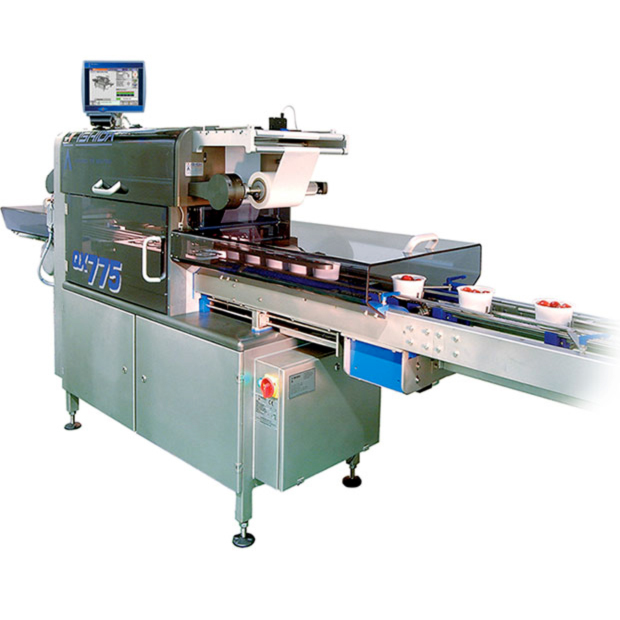 Now, Ishida’s advanced engineering and software have produced the QX-1100, a tray sealer with easy tool changeovers and the capability of speeds over 200 trays per minute. Improvements in changeover speed are equally dramatic. In minutes, the QX-1100 can be running just as fast with a totally different tray: whatever size or shape your busy schedule demands. The revolutionary QX-1100 radically improves what you can do with the packing space you have, and how fast you can do it. It changes the economics of tray sealing by saving on materials and consumables, while making operators more efficient. Faster cycle speeds are achieved using servo motor control, an innovative gripper arm design, more intelligent software, and the option of twin-lane configuration. Tools can be rapidly built to meet any tray specification, significantly reducing design and manufacturing time. Changeover is exceptionally fast, made easier by a lightweight tool design and tool-handling routine that requires no lifting. The QX-1100’s sleek lines are hygienically designed to allow self-draining of water, enabling fast cleaning (IP 65). Sensitive parts are well-protected inside the durable frame, with rapid, tool-free access for servicing or replacement. A safe-clean mode insures the tool remains dry during machine washdown, keeping it ready for immediate use. Despite its high capacity, the QX-1100 is extremely compact. Combined with its high output, fast product changeovers and low running costs, this insures an excellent Return on Floorspace (RoF). Efficient tool design reduces air and gas consumption, while extensive use of servo controls saves energy. 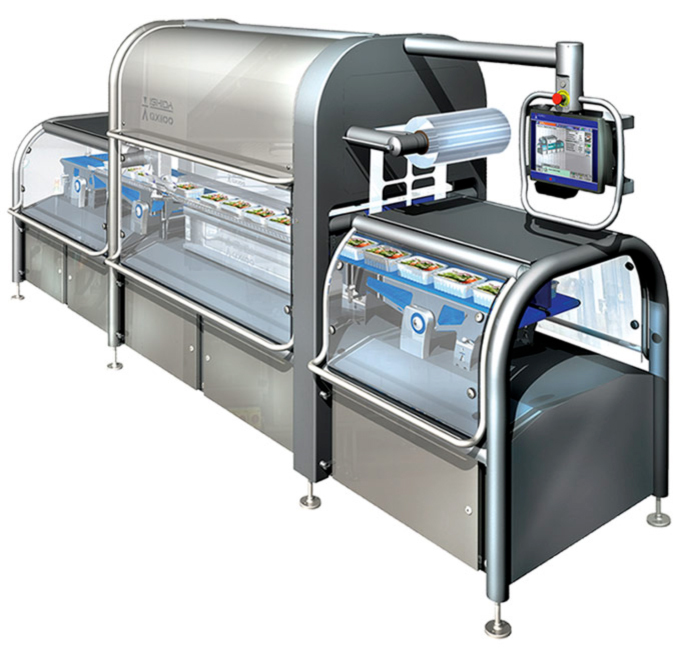 An integrated checkweigher enables reject of wrong-weight packs, saving film and allowing tray re-use (optionally available). The QX-1100 delivers a high-integrity inside cut seal, resulting in a superior pack presentation. On-line gas analyzing continually checks the gas injection mixture to insure the exact modified atmosphere is achieved (optionally available). The QX-775 offers maximum flexibility at a throughput rate of over 100ppm with single lane configuration. Easily integrated into any production line, making it the ultimate compact tray sealing solution. Available in standard and deep formats to suit retail and food service tray sizes. Fully compatible with all types of material including board, plastics and aluminum. Easy access to operate from either side. Highly reliable, hygienic and easy to run, offering an excellent return on investment. Unique inside cut technology, producing great looking packages with hermetic seal quality that’s second to none. Uses 5% less film. Utilizing the latest servo motor technology and upgraded control software, product transfer is safer and smoother than ever. Greater positioning accuracy insures a better quality seal, while smooth operation greatly reduces product loss and damage. Facilitated by a single push button tool release system and backed up by new software, product changeover has never been quicker or easier. All tooling is designed specifically to suit exact customer requirements. We can offer solutions for any tray sealing application from crimping to inside cut MAP. The smaller footprint of the QX-775 uses a minimum of your valuable production floor space. Modern sanitation requirements demand ever increasing levels of cleanliness. All product feed areas are sealed to IP65 standard, allowing quick and easy washdown with low pressure hoses and minimizing downtime for cleaning. Ishida is a leading manufacturer of weighing (Combination Weigher and Check Weigher) and packaging equipment (Tray sealer) for the manufacturing industries.